What Types Of Bees Are Found In The Atlanta Area? Home » Blog » What Types Of Bees Are Found In The Atlanta Area? through pollination. Without them many animals would be without homes and nutrition, and humans would be without many delicious fruits and vegetables, as well as cotton, flowers, and more. Basically, there would be a lot less things to enjoy! That being said, no one wants bees in their home, and their stings can lead to some serious illnesses should a person be allergic or sensitive to them. Even those that aren’t allergic can face adverse side effects if stung by too many at once, which could happen if they have set up a hive on your property. Now, there are many types of bees throughout Georgia and the Atlanta area, and we are here to focus on a few of the more common types: the honeybee, the carpenter bee, and the bumblebee. The carpenter bee does not make honey, but they contribute a lot to the world in terms of pollination. Rather than form a hive, they will burrow into wood to form a home for their colonies. The males have no stinger, making them quite harmless, and the females are capable of stinging, but will rarely do so, unless they are provoked. The honeybee is another important type to recognize, but we want to point out that this is one kind of bee we do not remove. It is probably obvious what the main job of a honeybee is – they make honey! Honeybees come in three categories: the workers, the drones, and the queen bee. The workers do everything necessary to produce and store the honey that we love to eat. The queen bee lays eggs and helps guide specific behaviors in the other bees, and the drones fertilize the eggs, so future generations can continue on. Finally, there’s the bumblebee. 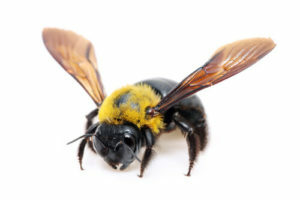 These big, furry bees are more social than carpenter bees, and they are led by one dominant queen who starts a new colony every spring after the old one dies in the cold winter months. They excel when it comes to pollinating, and they live in nests found on the ground. Unlike honeybees, when bumblebees sting they do not die. That being said, they will likely refrain from stinging unless they feel threatened. Need Help From A Professional Team? Have a bee problem and need professional assistance? The team here at Smart Solutions Wildlife Removal is here to help you out. In fact, we can help with all of your pest removal needs, whether you are dealing with bees, wasps, ants, cockroaches, spiders, millipedes, and more. We are licensed, insured, and have over two decades of experience, so you can rest easy when you depend on us for all of your wildlife removal needs. We can even clean, restore, and seal up your attic space at the end of it all! Request an appointment today, so we can get started.